I’m doing some research into Oakeshott’s Type I1 octagonal pommels. In the myArmoury article on this subject it is noted that I1 pommels are most popular during the 14th and 15th centuries. However, I’m finding museum examples thet seem to indicate it was around as early as the 12th. 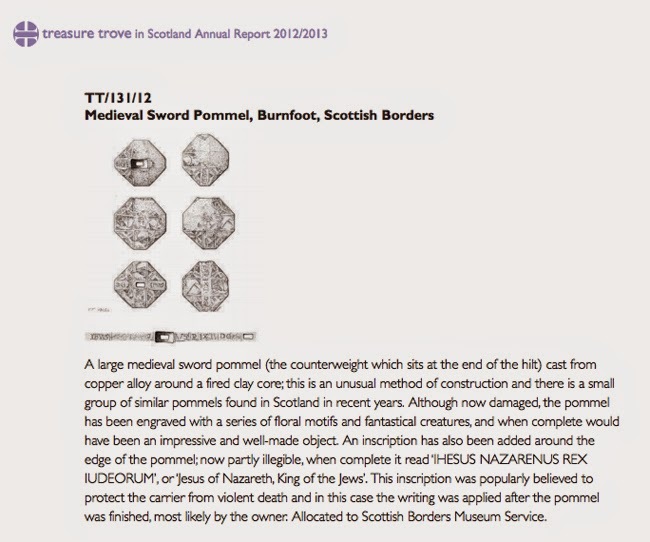 We have a semi-recent Israeli find (a crusader sword) dating to the 12h century. Also, the purported sword of Konrad von Thuringia showcases a faceted pommel of this kind. Additionally a sword existing in the Army Museum in Riga showcases an octagonal pommel, and lastly there’s been a find of a 13th century Scottish pommmel of the same type. These finds have occurred across Europe and seem to indicate that this style was known across the continent before the 14th century, though perhaps not as popular as it would eventually become. Perhaps some of these may be a transitional type between I and I1. Are there any thoughts out there about the plausibility of a pre-14th century date for the “popularity” or at least plausibility of this type of pommel? I would be a little bit leery about the last two examples. I'm not convinced from the single photo that the unearthed object in the deadlinenews article is indeed a pommel. It could well be, but the fact that it looks like an "old doorknob" is odd and makes me think it could be something else. The fact that it's bronze wouldn't rule it out as being a mace head; we'd need to see a photo of the other side. It might not even been part of a weapon at all. I'm a bit leery about the Bonham's sword. The pommel is quite unusual, enough so that I wonder if it's truly a genuine medieval sword. It's certainly not impossible but the pommel is cause for pause. Likewise, the blade is quite unusual. Bonhams gave it as a Type Xa, while Jack Loomes thought it was a Type XI. It almost looks like it could be a Type XI.a. However, the problem with any of these designations is that the blade seems to have the profile taper and point section of a Type X sword, with a particularly narrow fuller. It's the combination of a narrow fuller and a classic Type X profile that makes it odd; Type X.a, XI and XI.a tend to taper more near the point section. So, while it could be a genuine antique, there's enough details to make me leery barring further information on this sword. I am pretty sure Oakeshott gives a photo of the pommel from a sword unearthed by Dr. Leppaho that dates to the 11th century with a pommel of this form. Whether or not this early dating is accurate is up for debate, but I think there is enough evidence to indicate that such pommels existed prior to the 14th century--no later than the 13th century. 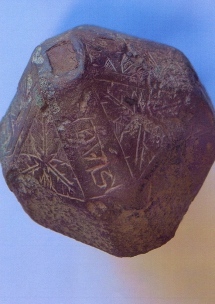 The Selkirk find is a pommel. Decorated with floriate patterns and a fragmentary text; "USREXJUDE", its peirced by a rectangular tang slot. Here is another pommel with some decoration on it: a face in the center, and around the edge I can make out at least the letter 'A', a flower, a great helm, and shields. It's from Norway, no specific date given, but I would guess it dates to the 14th century or a little before. The pommel is not quite a dramatically angular as the sword from Bonhams, I think it is more similar to one that was included in the Form and Thought exhibition, and was dated circa 1150-1250. There are a couple more very similar examples to this one. The Bonhams sword is unusual looking, but I think this "octahedron" pommel type did exist. Here is an example from the Czech Republic that has been published as dating probably to the 13th century. Thanks all for the input. As I continue to research, I believe that there’s more variety than we can definitively articulate. Of course, we must strive for historical accuracy, and in doing so have found some unique extant examples. I should have clarified: it's more the appearance of this, particular pommel on the Bonham's sword, than the overall shape and form, which has me wonder about its authenticity. Maybe it's just the angle of the photo of the Bonham's sword, but the pommel looks different from the Czech sword you have posted. The Czech sword and its pommel look authentic to me, while the Bonham's pommel seems somehow off. Anyway, we don't have enough information to say about the Bonham's sword for sure, but I have my doubts.